Thought i'd try a sand pool filter converted to a gravel filter. It has plenty of surface area and the valving on it makes it easy to direct the water. 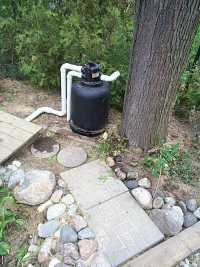 You can recirculate through the filter back to the pond or go directly to discharge or backflush the filter to clean it. We got this one at Leslie Pools. It seems to polish the water pretty well. The discharge line is exiting out the back and down into a 1 1/4" black plastic pipe that is buried around the pond and over towards a garden. We'll see if we can double duty the discharge to water the garden.